Our hotel is located 8 km from the bridge connecting Ile de Ré to the mainland. After crossing the bridge and arriving on Ile de Ré, go in the direction of Sainte-Marie-de-Ré on the D201. Continue until you reach the town of La Noue. Leave the D201 and enter La Noue. 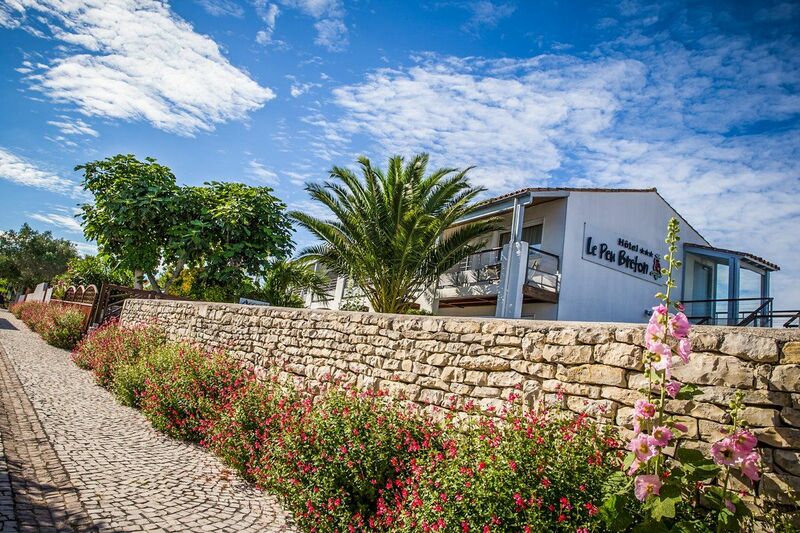 All you have to do now is follow the signs to Hotel Le Peu Breton. La Rochelle – Ile de Ré Airport is located 12 km from the hotel (around quarter of an hour). It has direct routes to Paris Orly, Lyon, Brussels Charleroi, Geneva and many other European cities. Information can be found on the website www.larochelle.aeroports.fr. A bus service (route 3) takes you to Ile de Ré through the centre of La Rochelle. Our hotel is 10 minutes’ walk from the stop La Noue Crapaudière. Gare de La Rochelle train station is 22 km from the hotel (around half an hour by car). From the station you can reach the hotel by taking the Ré Express bus (which departs in front of the station). Remember to take cash to buy the ticket (€5 per person). Our hotel is 10 minutes’ walk from the stop La Noue Crapaudière.